MILKK are a Nashville, TN based alt-pop trio dropping their sophomore EP titled “If You’re Reading This, I Love You.” Hand picked to open for one of our former Artist To Watch artists, The Stolen on their upcoming US tour, MILKK will be your new favorite band very very soon. “IYRTILY” is only four songs but make no mistake – those four tracks are jam packed with silky synths, smooth vocals, and grooves that you’ll want to play on repeat forever. It’s hard to pick a favorite because each song has such a different mood but they effortlessly melt together to make one solid EP. “I Hate This Song” takes a hard left mid song bringing in some dark heavy fuzz but the effortless switch is exactly what made us fall in love with this band. Sophomore slump, who? MILKK are at the top of their class with the new EP. Watch MILKK’s debut music video for “Leaving” below! MILKK’s new EP “If You’re Reading This, I Love You” is available now on iTunes, Amazon, and Spotify. Grab a copy so you can sing along on tour! Be sure to follow MILKK and Secret Fangirls on Twitter for more on your new favorite artists. Jake Miller just treated fans to his brand new single “Overnight” from his upcoming EP of the same name, out on August 19th! Earlier this year, Jake let his fans know he would not be rapping on any of the new music. But his vocals (and his wonderful arms) are front and center with his new music! The new song pleads to patch up a torn relationship, overnight. Listen to “Overnight” below! You can catch Jake on tour with Fifth Harmony this Summer. Check out the dates here. Be sure to pre-order a copy of the “Overnight EP” on iTunes or Amazon now. Follow Jake Miller and Secret Fangirls on Twitter! Jackson Guthy’s project North of Nine just released a new album called “IM@GINE” as a New Years present for eager fans. As Jackson wrote on Facebook, “This album brought me back to the beginning. Me at my piano making music I love.” The album is very much in Jackson’s style – think piano driven pop with some jazzy horns and funky beats alongside his unique, raspy vocals. The album will be available on iTunes and Spotify January 8th but for now, you can listen to the entire collection of songs on SoundCloud below! Jackson also enlisted artists to design special album artwork to go along with each track. Learn more about each artist and the track that inspired them at NorthOfNine.com! Be sure to follow North Of Nine and Secret Fangirls on Twitter! Long Island native pop-punk outfit Patent Pending are set to play a hometown show in Long Island before heading over to the UK for their massive tour with Zebrahead! 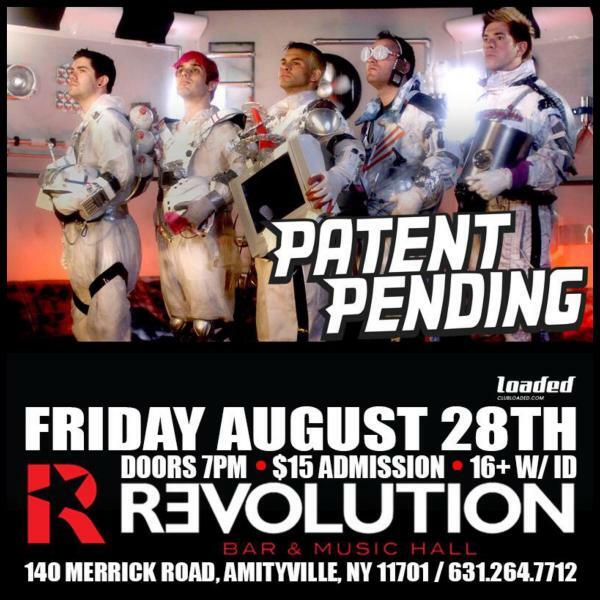 This special home town show will be at Revolution Bar in Amityville, NY on Friday August 28th. The show comes just after the release of their “Armageddon” EP, out last week! We’re sure it’ll be a smashing good time, and guaranteed to make your day brighter! Pick up a copy of Patent Pending’s brand new “Armageddon EP” on iTunes (US or UK) or Amazon (US or UK) now! Be sure to follow Patent Pending & Secret Fangirls on Twitter.